ERICS stands for European Refugee Information and Communication Service. In this follow-up project, we develop a multimodal multisensor interaction server for a chatbot application. The server extends our digital manufacturing server from 2016. The major impact is on societal integration of refugees, i.e., enabling mutual understanding and mediating FAQ on certain information, e.g., accommodation, asylum, culture or life in the EU. Our solution saves integration costs and speeds up time-to-job, while providing opportunities for services offered by public as well as private organizations from, e.g., education, legal counselling, job offerings, etc. Lead DFKI partner is Deutsche Telekom AG. This project based on SmartWeb technology (BMBF) and is supported by EIT Digital (H2020). What is the goal? Refugees and migrants often lack essential information about asylum, housing, health, kindergarten, university, or work. Even when they know where and how to query this information on the Internet, this process can be very time-consuming, exhausting, disorienting, and confusing. create an empathic and engaging visual interface. facilitate a natural text-based dialogue between users and our chatbot during the information seeking and retrieval process. collect user feedback to further improve the chatbot service across time using machine learning. We developed the chatbot Eike that answers migrants’ questions about Germany (it was launched on handbookgermany.de). The API supports advanced presentation (n-best presentation) and logging capabilities that allow us to learn from user interactions (community-based crowdsourcing or crown-sourcing services). Crowdsourcing is recently used for building semi-automatic systems when automatic approaches alone fail. In this project, we investigated how users-in-the-loop can effectively contribute to natural language translation. In 2017, our project partners launched Capiche: a smart language-assistant for refugees which is based on crowdsourcing. We achieved a new milestone in our EIT project ERICS: The chatbot Eike, which is based on our multimodal multisensor platform, was launched at handbookgermany.de. ERICS provides cloud-based translation and search services to improve communication with refugees in Europe when they are looking for online information about their integration. DFKI supports GPU mobility concept via 5G. DFKI provides open-source software tools to be downloaded from the Software section. For example, Fine-tuning deep CNN models on specific MS COCO categories (PDF). It covers our freely available software py-faster-rcnn-ft which allows straightforward fine tuning of deep convolutional neural networks for image classification. ANNOUNCING The Handbook of Multimodal-Multisensor Interfaces: Foundations, User Modeling, and Common Modality Combinations. Volume 1 EDITORS: Oviatt, Sharon; Schuller, Bjorn; Cohen, Philip R; Sonntag, Daniel; Potamianos, Gerasimos; Krueger, Antonio PUBLISHER: Morgan and Claypool/ACM Press. This is a THREE volume series that presents the definitive state of the art and future directions of the field of Multimodal and Multi-Sensor interfaces. The EIT Digital NewsRoom entry published ERICS Roadmap in Digital Cities. See also the EIT digital news entry. DFKI releases video about anomaly detection use case within distributed digital manufacturing architecture. Kick-off ERICS in EIT Digital Infrastructure; we will adapt the digital manufacturing architecture to the ERICS usecases of real-time multimodal interaction and interactive machine learning with crowd-sourcing options. 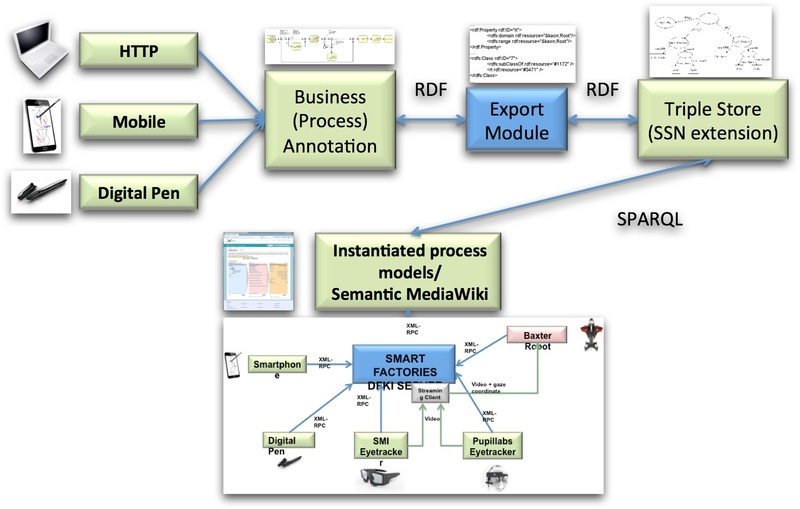 DFKI deploys distributed digital manufacturing architecture at Siemens corporate technologies. Springer Professional features our publication "Overview of the CPS for Smart Factories Project: Deep Learning, Knowledge Acquisition, Anomaly Detection and Intelligent User Interfaces"
DFKI conducted a user study regarding the evaluation of the handwriting and gesture recognition systems used in Smart Factories. The study was carried out in cooperation with MyScript and attracted a total of 120 participants. Our publication gaze-guided object classification using deep neural networks for attention-based computing is featured by Pupil Labs. We built our software on top of their open source eye tracking platform. Patrick van der Smagt joins Volkswagen Data Lab and leads an new AI division on Robotic Enterprise. ELTE and DFKI present two technical papers about deep learning for gaze estimation and hand gestures at KI 2016. Moniri et al. in cooperation with MADMACS win Best Video/Demo Award at the 12th International Conference on Intelligent Environments 2016 (IE 2016) with the HRI paper: Human Gaze and Focus-of-Attention in Dual Reality Human-Robot Collaboration. DFKI presents 4 smart factories demos at Ubicomp 2016. Michael Barz participates in The International School on Human-Centred Computing (HCC 2016) and demonstrates our gaze-based techniques towards spatial reasoning in smart factories. Joint press release of Volkswagen AG and DFKI: Volkswagen participates in DFKI and becomes a partner (shareholder). In a joint carrier project for cps for smart factories, Volkswagen and DFKI have started to develop a software framework to allow for new collaborative HRI (human-robot interaction) scenarios. Daniel Sonntag will present our activity at ESWC 2016 for EU H2020 networking. Mehdi Moniri presents DFKI's smart factories Baxter demonstrator Eyebots to Joachim Gauck, the President of the Federal Republic of Germany. See the future scenario of this human-robot interaction demo here. DFKI presents with EyeBots a new form of Human-Robot-Collaboration (HRC) at CeBIT 2016, contact Mohammad_Mehdi.Moniri@dfki.de. We thank our sponsors BMBF, MADMACS, EIT DIGITAL, and SMI. Patrick van der Smagt is keynote speaker at IROS 2015, see keynotes. Slides are available here. New Carrier programme: One of five Federal competence centers of Industry 4.0 in Germany will be opened in Kaiserslautern at DFKI and smartFactory. New Carrier programme: DFKI and ZeMA signed a cooperation agreement for "Power4Production" (P4P); smart production technologies in the automobile sector are in the focus. We will exhibit at AUTOMATICA 2016, the leading platform for optimizing your production processes. Siemens. Facts and Forecasts. Boom for Learning Systems: Autonomous Robots and Smart Machine Market. Markus Weber (DFKI, CPS for Smart Factories) wins one of the CeBIT Innovation Awards 2015. CPS for Smart Factories integrates the EIT cPAS activity and focuses on combined use cases in the steel and robot domain. We welcome our new Industry 4.0 partners from Fraunhofer (transfer of DFKI's digital product memory technology). Datagarten is a spin-off company of Fortiss GmbH. It is our most recent EIC-ICT Labs Innovation spinoff within the CPS for Smart Factories activity. For solving distributed parallel computations in a scalable manner that can still undergo optimisation, ELTE proposes the Task Oriented Programming (TOP) paradigm. The international programmer workshop will take place in Budapest on December the 1st, 2014. DFKI unveils hand-writing and gesture based knowledge acquisition tool and the new smart factories knowledge portal at Siemens Headquarters, Munich. See architecture. DFKI - Siemens Partner Contract signed. Kick-Off at EIT in München!